Halloween and Fall Festival promotions for business continue to increase -- placing it second only to Christmas promotion spending. While Christmas is by far the most promoted holiday for businesses, Halloween promotions continue to increase, according to a top promotional products firm, Bagwell Promotions. “We’ve seen our business increase over the years for Halloween and Fall Festival promotions,” says John Bagwell, President. What are businesses buying for Halloween? The most popular item is the Halloween Bag. Many business give these away to their customers in the weeks before Halloween. And it is not just the traditional business that hand these out. Police Departments, VFW groups, schools and other non-profit organizations use this as a way to keep their name in front of customers and potential customers. 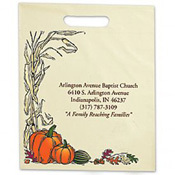 Often, businesses will donate bags to a local school for their Fall Festival or Halloween event. Bagwell Promotions offers a number of Halloween bags on their web site. In addition to traditional Halloween bags, the promotional product company also offers Fall Festival and Trunk or Treat Bags. “These are attractive to churches and other non-profit organizations that don’t want all the ghost or goblins,” says Bagwell. Because it is such a small market, many promotional companies ignore Fall Festivals and concentrate only on Halloween. Bagwell Promotions is one of only a few companies that sells Fall Festival items. Bagwell Promotions also offers a number of other items for Halloween and Fall including a Giant Pumpkin that is filled with toys that can be used as a sweepstakes promotion, and pumpkin stress relievers. Bagwell Promotions offers over 500,000 imprinted promotional products from 4,100 suppliers such as coffee mugs, pens, flashlights, magnets, ID bracelets, key chains and an assortment of apparel.